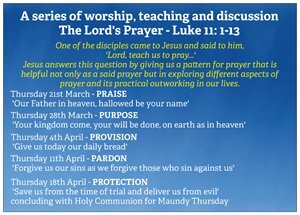 During Lent we will begin a series of evenings led by members of our different churches, exploring and discussing the way Jesus responded to the disciple’s question. 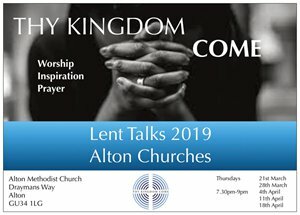 Under the heading Thy Kingdom Come… we will, over five weeks, unpack Jesus’ teaching on the Lord’s Prayer, meeting in Alton Methodist at 7.30pm. Everyone is welcome. We felt that this series will prepare us for the ‘Thy Kingdom Come’ prayer initiative introduced by the Archbishop of Canterbury in 2016 calling Christians to pray for the work of the church and the world in which we live. Not only that but to pray for people to learn, discover and come to enjoy the Christian faith. As last year, we are invited to especially set aside time to pray in the ten days between Ascension Day and Pentecost (May 30th -June 9th).